Under Article 7.9 of the Paris Agreement, all Parties are requested (but not required) to monitor and evaluate adaptation activities at the national level. Prior to the Paris Agreement, this request applied only to Non-Annex 1 Parties (Vallejo 2017). Unlike measurement and reporting for mitigation, metrics and reporting requirements for adaptation are less well-defined. To date, Parties commonly include a description of national circumstances and assessments of vulnerability and climate risk, along with both forward-looking information (e.g., goals, priorities, needs, and plans) and backward-looking information (e.g., actions, outcomes, and lessons) (Elliot et al. 2017). National Communications. The guidelines on National Communications for Non-Annex I Parties “encourage” them to provide “information on and, to the extent possible, an evaluation of, strategies and measures for adapting to climate change” (paragraph 35 in UNFCCC, 2002). National Adaptation Plans (NAPS). All developing countries are invited to develop a NAP. NAPs are not primarily a reporting vehicle but they can provide an opportunity for parties to report adaptation-related information, either in a separate document or as part of a National Communication. Parties are encouraged to review progress on the NAP process and report this information in their National Communications (Elliot et al. 2017). Nationally Determined Contributions. Parties are invited to communicate “undertakings in adaptation planning” in their NDCs, though there are no guidelines or requirements for the type of adaptation information to communicate (Elliot et al. 2017). Almost half of the Parties to the UNFCCC that included adaptation within their NDCs referenced the importance of monitoring and evaluation (M&E) of adaptation. Relatively few countries, however, have designed and implemented a national system for adaptation M&E (rather than at the program or project level, for example). The indicators that countries are using in national adaptation monitoring and evaluation systems can be broadly categorized between indicators providing information on climate readiness, on climate risks, on adaptation processes and on adaptation outcomes. Indicators of readiness (e.g. clear institutional roles in agencies and local jurisdictions) reflect the capacity to plan, implement and monitor climate finance and activities related to climate change. Readiness indicators can help donors and policymakers anticipate what is needed to make progress and track that progress (Wollenberg et al. 2015). Indicators of risk track climate hazards, impacts, exposure or adaptive capacity. Examples include change in annual precipitation or percentage of coastline under marine protection. Process indicators provide insight into the implementation of programs or policies, such as the number of community members involved in capacity building activities or the number of agricultural policies revised to account for climate change. Outcome indicators track the actual impact of adaptation policies and projects on climate risk or adaptive capacity. Examples include the number of farmers who have access to credit, or irrigation coverage of previously un-irrigated agricultural area (Vallejo 2017). Indicators can also be categorized according to the domain of adaptation action. FAO (2017) recognizes four domains of adaptation actions and indicators for agriculture: natural, productive, socio-economic and institutional. 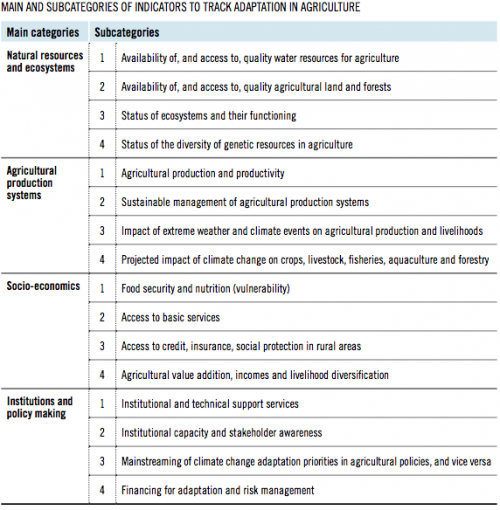 A review of indicators of climate smart agriculture used by international development agencies and multilateral development banks found 322 indicators for adaptation in the agriculture sector. The Climate Smart Agriculture (CSA) Programming and Indicator Tool may be used to select indicators based on the goals of a project or policy. Compilations of indicators specific to the agriculture sector are also available from FAO and GIZ.